The Precambrian time is a super eon that encompasses 3 eons, the Hadean, the Archaen, and the Proterozoic. It is The first and longest subdivision of time for the earth. The earth took form about 4.5 billion years ago. For the first 4 billion years of that time, the Earth was growing and changing. The Hadean Time was the first eon, but it is not a geologic time period. It was the time when the earth was molten and had not yet formed a crust. It is not a geologic time because there were no rocks yet. The Archaen time followed the Hadean. The earth began to form a crust. AT some point during the Archaen Eon the first stirrings of life began. It is not clear exactly when this happened but there are fossils of bacteria that date back to about 3.5 billion years ago. The Proterozoic Erawas the final episode of the Precambrian. 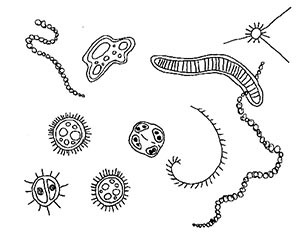 During the Proterozoic life evolved from simple bacteria having prokaryote cells, first to more complex single celled organisms, the eukaryotes, and then to multi-celled plants and animals. It is also during this time that the earth's atmosphere was transformed by cyanobacteria. Cyanobacteria were the first to use photosynthesis. Using the energy of the sun they could make food for themselves. Oxygen is a byproduct of photosynthesis. Over time the atmosphere became oxygenated. This is of course a brief overview. First, the Earth formed. The outer covering of the earth cooled and hardened into a crust. The hot molten insides of the Earth leaked out at weak places in the crust. These volcanoes created more rock surface on the young Earth. The clouds formed by the volcanoes caused huge amounts of rain to fall and the oceans were created. When the crust cooled, huge pieces of the crust began to move in different directions. These are called tectonic plates. The tectonic plates still move around on the surface of the earth today. They bump and push against each other. Sometimes the edge of one plate moves under the edge of another. This causes the continents to move around and change shape. This movement has been going on since the formation of the earth's crust. The first continent was huge. It is called Rhodinia. It formed about 1.1 billion years ago. 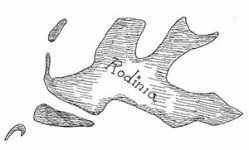 Rhodinia contained the modern-day continents. North America was in the middle. South America, Australia and Antarctica were all around North America. About 350 million years later, the first ocean formed around Rhodinia. It caused the supercontinent to break into two parts. The part that contained North America moved toward the South Pole. The rest of Rhodinia moved toward the north. 150 million years later they collided again to form a new super continent,Pannotia. The first life formed. This was not cell life as we know it, but it was life just the same. The oceans were not like the oceans of today. Some say they were thick like soup. The chemistry of the oceans made them the perfect place for life to begin. The first one-celled organisms formed during the Archaen Era about 3.5 billion years ago. They were simple bacteria. It took many millions of years for more complex cells to develop. Some of these new complex cells learned to photosynthesize, making food from the energy of the sun. They had an important job to do. They helped make the air and water around the Earth full of oxygen. Once there was plenty of oxygen, new life could form. This life would have many cells together to make different kinds of animals. All of the important work of the Precambrian made the Earth ready for what would come next. A new Era was about to begin: the Paleozoic Era. There was an explosion of life forms in the next period. It is called the Cambrian Period.